We don’t have any new recipes to share with you today, but I thought I would give you an update on some of the things we are working on right now and some of the projects we will be taking on this year. 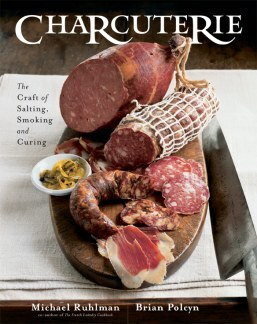 A while back, and I don’t even know how long ago, I got a copy of Michael Ruhlman and Brian Poleyn’s Charcuterie. I had every intention to dive right in and make some home made bacon and Canadian bacon. You know what they say about the best of intentions? I pulled it off the bookshelf, dusted it off and have now committed myself to finally attempting some of those recipes. At some point, I must have mentioned to my brother, the other Mr. G, that I didn’t know where to find pork belly. He told me to try an Asian market. 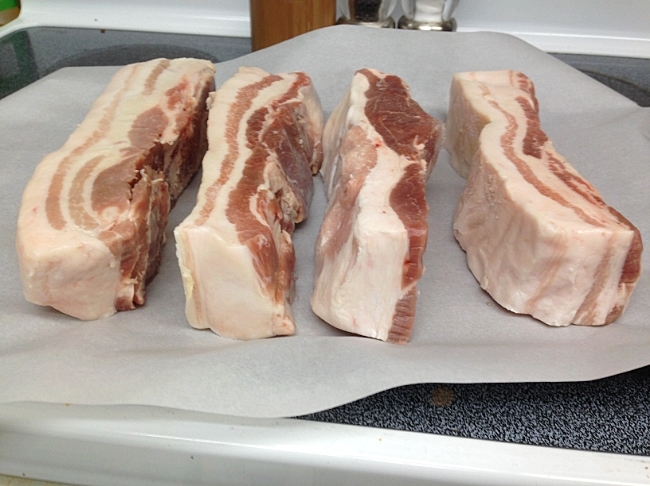 Later on, he brought me right around 5 lbs of pork belly which got dumped into the freezer and lost. While I wish it was one solid slab, I’ll work with the 4 smaller ones I have now. Getting into Charcuterie was one of my New Year’s Resolutions. From what I have heard, store bought bacon does not even compare to the stuff you can make at home. 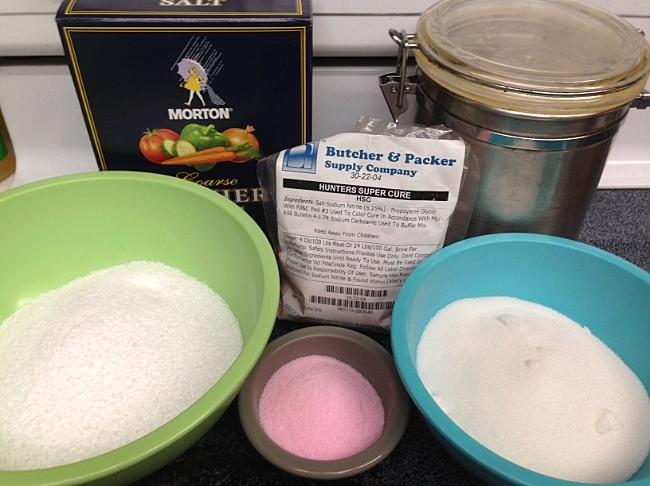 It does require curing the meat for around 7 days with a basic cure of Kosher salt, sugar and Cure #1. 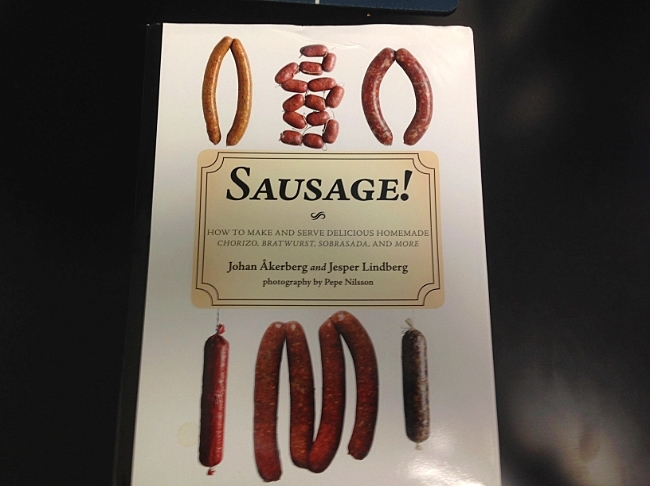 The other thing I need to get underway is a book review of Sausage! by Johan Akerberg and Jesper Lindberg. The nice folks at Skyhorse Publishing contacted me back in November and offered me the opportunity to review this new book. Unfortunately, the holidays got in the way, but now that things are returning to normal, I’m looking forward to diving into it. They gave me permission to reprint two or three of their recipes, so I’ll be scouring the book looking for the ones that most appeal to me and I’ll share them with you. The pictures are very appealing so it might be hard to pick, but I’m leaning towards one of their pork sausages, a duck sausage (if I can find some duck) and possibly a seafood sausage. They have one they call Moules de Mer, crab and lobster sausage with moules mariniere (a bowl of mussels) and French fries. I know Mrs. G will be a fan of that one. 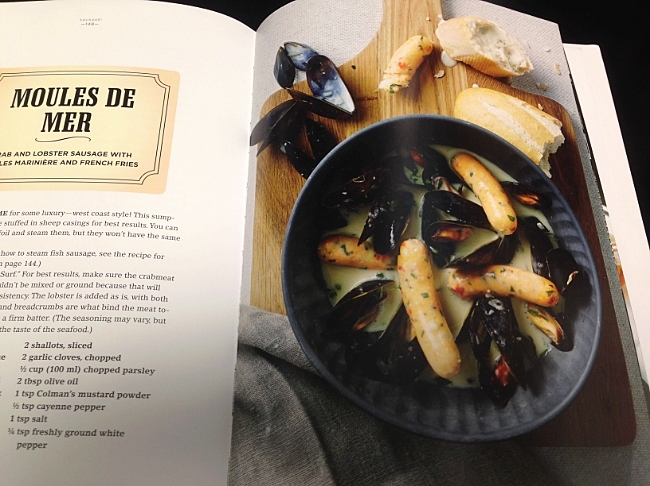 Moules de Mer – I know Mrs. G is going to love this one. The authors have also included quick and simple recipes for sides (such as sauerkrauts, pickled red onions or German potato salads to name a few) and home made condiments (mustards, ketchups, curry sauces and more) to go along with each sausage. I am really excited to get started on some of these right away. Don’t think we’ve forgotten about the Flame Boss. 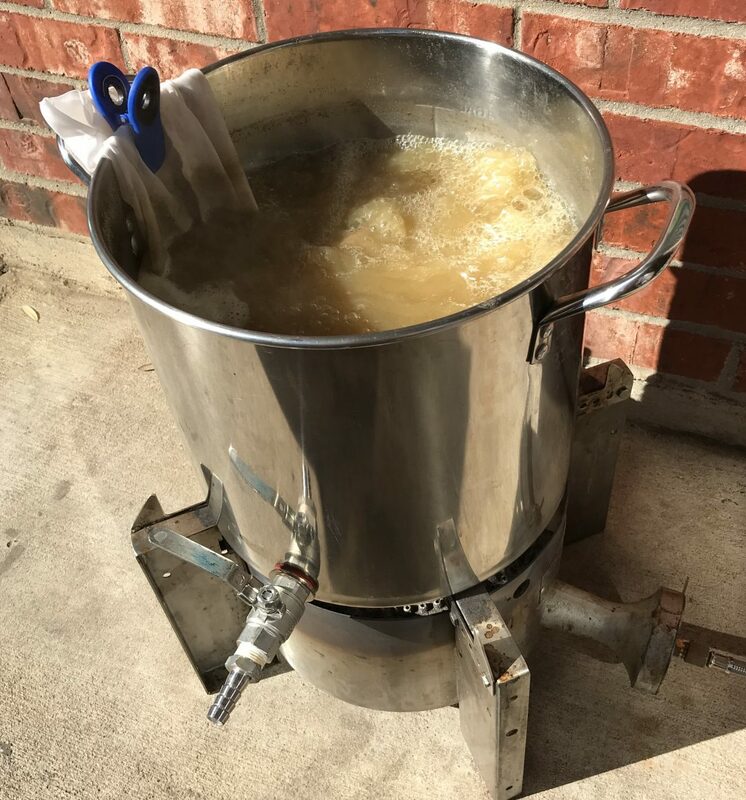 We’ve used it a few times here and there and so far our initial impressions have been really postitive, but we are going to really put it through its paces now. Expect a thorough review of how it performs and what we like and/or don’t like about it. Along with dabbling in some Charcuterie and stuffing some sausages, we will strive to bring you new and fresh recipes this year including grilled foods, smoked foods and even some prepared solely in the kitchen. And we’ve got a few reviews that will be coming up early in the year of some new products that I am excited to try out. So that’s what we’ve got planned. As always, we love hearing from each and every one of you, whether it’s you sharing your opinions with us, offering us suggestions or asking questions. If you have any ideas or recipes that you would like us to try, feel free to tell us about them. If you have a recipe that you would like to share with us and possible see here on the blog, send it our way. We love interacting with you, so make sure to leave us a comment. Here’s to a bigger and better New Year in 2014! Disclaimer: Michael Ruhlman and Brian Poleyn’s Charcuterie was purchased with our own hard earned dollars. We have had no contact with either of them or their publishers and have received no monetary compensation from them. The publishers of Sausage! 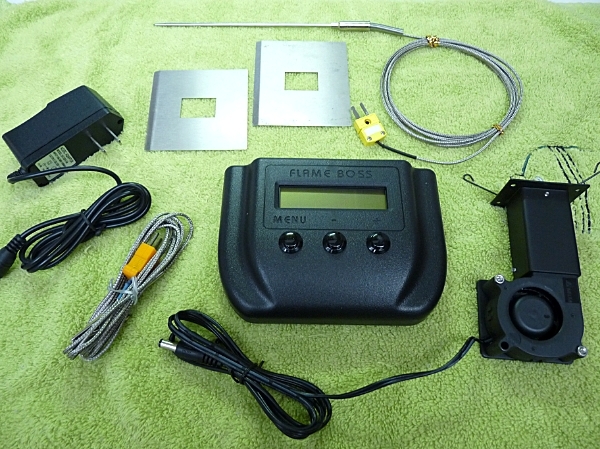 and the makers of Flame Boss contacted us and sent us their products free of charge. There has been and will not be any monetary compensation from them for reviewing their products. We have always been and will continue to be a non-profit blog, doing it for the love of it and not in the pursuit of money. Thanks, Greg. I know exactly where that is. Used to live around the corner from there and it would be easy to take a detour on the way home from work. Will give it a shot. Sounds good, old chap. Making bacon is also something I’ve been meaning to try, but just keep putting it off. 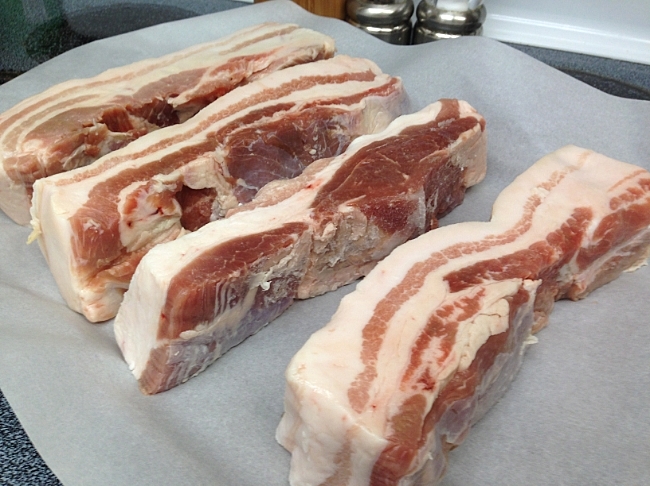 Your article here inspires me and get some pork belly in action! Tho it is probably not recommended, I’m probably going to try it without the pink stuff, because I can. And just toss into the freezer what ever bacon I don’t intend to use for a while. I’ve read of dudes doing it that way, and their still alive I think. Congrats on your pending reviews too. They can be kind of fun. Great attitude too, by the way. Keep it up, man! Are you planning on hot smoking or cold smoking? I hear you can use celery salt instead of Cure, but don’t know the amounts and it still has sodium nitrate in it. Kind of in between, actually, but more towards hot smoking. I was planning on running the pit somewhere between 150 and 175 or higher, until the internal temp of the pork belly reaches 150. About 3 to 4 hours, they say. Here is a link to the fellow who’s techniques I’ll probably end up using. The idea of going nitrate-less just appeals to me. Let me know how it works out for you when you get around to it. I am definitely curious and might give it a shot as well.